A specially designed gift box with transparent cover contains 20 pieces of 5g chocolate bars. 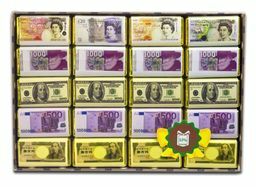 The chocolate bars have pictures of British Banknotes beside with other world main currencies printed on the wrappers. The total chocolate weight is 100 g. Tasty Belgian dark (cacao 53% minimum) or milk (cacao 28% minimum) chocolate. Suitable for Vegetarians. No alcohol.